Well we have all by now heard the news from Apple about the upcoming iPhone 4 and new iPhone OS now to be known as iOS. I will just give you a quick highlight recap and then talk about what I think is even more interesting. What wasn’t mentioned in this weeks Apple Keynote. First Steve made a quick mention of what a huge success iPad has been selling over 2 million units in just 60 days. Now with international shipping underway that number is sure to skyrocket just as fast as Apple can make these fantastic devices. I think John Dvorak is going to loose his bet toLeo Laporte on Apple selling five million iPads in the first year. We will probably make that number in six months. The iBooks application already has a 22% ebook market share in just the first 8 weeks. Amazon got us excited with the Kindle and whetted the publics appetite for e-books and while I still like and use my Kindle the iPad just does so much more and now that is the device I never leave home without. Now Apple is adding the ability to read PDF’s right in iBooks on our on PDF Bookshelf and giving us the ability to take notes right on our PDF’s and Books as well as bookmarking and highlighting the text. iBooks is ready now to be the killer app for education in the 21st century. Apple has also included wireless syncing of all of our books, PDF’s and our data between iPhone, iPad, iPod Touch, and I am hoping someday a desktop app which will allow me to consume my content where ever, when ever and how ever I choose. In Steve’s speech he mentions that iOS supports two platforms HTML5 and the App Store. HTML5 is a fully open and uncontrolled platform. Anyone can develop anything they like and run it in the Safari browser. The App Store is a curated platform where Apple vets the Applications before they are placed in the store for sale. Apple gets 15,000 apps a week that are submitted in up to 30 languages. According to Apple 95% of apps are approved in 7 days. Steve went on to mention the top three reasons an application doesn’t get approved. Still there are issues with a few apps that get pulled for strange reasons such as the political cartoon application which was rejected for reasons of content and later was put back in the store when the developer appealed the decision. Or the Pulse Application for the iPad that was pulled because The New York Times demanded it be removed for containing copyrighted material. It was taken down, the developer removed the sample RSS feed that pulled New York Times content and the app was back in the store later in the day. I would like to hear from any developers that read this blog about their experiences submitting to the app store. Both positive and negative to get the perspective of those that deal with the App Store on a regular basis. If I turn it into a follow up column later you will of course be anonymous. Netflix for the iPhone coming this summer for free. Netflix is using adaptive bit rate technology to adjust video quality based on network speed and allow you too seamlessly switch between wifi and 3G. AT&T capping data will really put a damper on this application. You can stream movies over wifi with no problem but just a few movies on the Pro plan and you could blow your data usage for the month. I have and I am keeping my unlimited data plan for my iPhone which is good for me but with multi-tasking and NPR streaming apps, Pandora streaming apps, and Netflix streaming those that have to spend a lot of time on 3G might find they get unreasonably large bills from AT&T or don’t use the capabilities of their phone for fear of going over their cap. This is just another way AT&T is holding up the progress of technology and failing their customers. I have already gone over that in depth in Is AT&T Business plan to give away all of their customers to the competition? Zynga is bringing everyones favorite Facebook time waster FarmVille to the iPhone. Now you can work your farm while you are in line at the bank or out at a bar with your friends. Send a friend a gift in FarmVille with them sitting right next to you. Zynga has 35 million players playing games daily and over 70 million players of FarmVille per year. Over 200 million gifts per day are given in FarmVille and will be on the iPhone by the end of June. We are evening getting an option for a tractor and a pet Snow Leopard for iPhone FarmVille players. Guitar Hero is also coming for the iPhone. The demo may have not done it justice and since I myself have never played Guitar Hero at all I didn’t really understand the game play experience they talked about in the demo. iMovie is going to be available next month on the iPhone 4 for $4.99 and give users the ability to edit their videos, add transitions, add titles, and edit the audio in your video before uploading it to You Tube, sending it via email, or other uploading options. For just being around three years now starting on their fourth year to be second only to RIM maker of the Blackberry line of phones is an impressive feat. 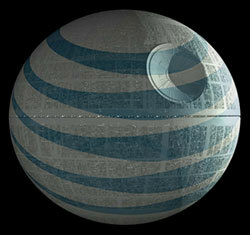 Particularly given the fact AT&T seems to really be holding Apple back on sales. In a recent report 16% of Verizon customers would buy an iPhone if it were offered on Verizon’s network. That is a huge number of potential customers untapped due to AT&T’s exclusivity deal with Apple to carry the iPhone. Once the agreement ends and iPhone becomes available on other carriers iPhone could potentially control the smart phone market. The new iPhone sports a glass front and back with a stainless steel band around the phone. The new iPhone 4 is 28% thinner than the current 3G and 3Gs iPhone making it the thinnest smartphone on the market. The new glass front and back is made from the same glass that is used in helicopter canopies and high speed train windshields. That with a new process to strengthen the glass is supposed to make it 30 times stronger than plastic. Hopefully that means our phones will not scratch as easily. While my phone screen has never been scratched the plastic back is pretty scratched up from my keys in my pocket and the dock connector in my car. The new Retina display just couldn’t be fully appreciated on the video. Apple had a special high resolution projector installed for the presentation so people in the audience could see the difference between the old displays and the Retina display. The new Retina display at 326 pixels per inch is such a high resolution display most people can’t differentiate the pixels at 12 inches from the phone. With 4 times the number of pixels and the IPS LED backlit screen on the new phone the screen is sure to look stunning. With the new A4 chip in the the iPhone the new phone will be faster and more power efficient. With the speed of my iPad I can’t wait to get my hands on the new iPhone 4. While the phone is slimmer they were able to increase the size of the battery to give us about 7 hours of talk time, 6 hours of 3G browsing, 10 hours of wifi, 10 hours of video playback, 40 hours of music or 300 hours of standby. The antennas are part of the phone structure. The frame of the phone is the stainless steel band around the outside of the phone also serves as the two antennas. One antenna is for the Bluetooth and 802.11n WiFi and the other antenna is is for the cellular and HSDPA which no supports 7.2 Mbps down and 5.8 Mbps up when carriers upgrade to support those speeds. 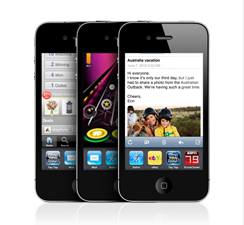 There was no change in storage capabilities, the iPhone 4 comes with 16 GB or 32 GB of storage. With the explosion of downloaded music, movies, applications and the addition of a higher resolution camera and the ability to record HD video I think extra storage would have been helpful. Hopefully we will get some streaming options in the future for iTunes content we own so we don’t have to store everything on the phone. The 5 Megapixel backside camera has an LED flash or the LED can be left on for shooting 720p HD video. The sensor is larger so it works better in low light conditions it is also backside illuminated to work better in low light situations. 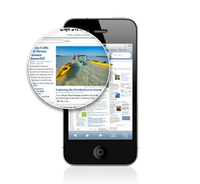 The iPhone software includes a 5x digital zoom and tap to focus in both still and HD video. iPhone 4 also adds Geo location information to the video while it is being recorded so you can remember where you took the video. The travel template also uses Geo location to give you the Indiana Jones sort of intro showing a pin on a map of where the video was shot. A GPS, Accelerometer, compass and gyroscope for 6 axis motion sensing are available to the new core motion API. This will give the phone more information about where it is in space and make the iPhone more aware of its environment. This is going to be huge for gaming and advertisers will be able to tap into these functions to give users more useful information about the world around the phone. Apple expects to sell 10’s of millions of iOS devices this year. The iPhone pre-orders start on June 15th and we will be able to pick up our iPhones on June 24th. Apple has dropped the 3G iPhone and moved the 8GB 3GS into the $99.00 spot and added a $199 16 GB and $299 32 GB iPhone in Black or White. The new iOS 4 has 1500 new API’s for developers and over 100 new user features including multitasking done right. Even Steve pointed out while they were not the first to have multitasking they did it right. Double tap the home button to access the running applications. The apps when they are not in the foreground are saved out to the flash storage. If the application needs to keep some parts running like audio for Pandora Radio is controlled by Core Audio when the application interface is in the background. This way you get multitasking without sacrificing battery life. Part of these new API’s include a right swipe gesture on any app to reveal the audio controls for which ever app is sending audio to your headphones and allow you to fast forward, rewind, play, pause, or adjust volume. With the explosion of applications and the ability to display 16 apps on a screen and 11 screens for a maximum number of displayable apps of 176 apps that just isn’t enough for the modern iPhone. So now we have folders. Simply drag an app onto another app and it will automatically name it the same name as the genre of application it is and you have a folder. You are free to rename the folder or add more applications if you like. Now we can have thousands of applications available on our iPhones. Unified Inbox now gives us the ability to look at multiple inboxes at the same time. So we don’t have to swipe back and forth between our personal and business email accounts we can manage our digital lives in just one inbox just like on the Mac. To help keep everything organized they have also added message threading so you can keep track of a specific conversation. In keeping with the big business theme iOS 4 also includes better enterprise integration, better data protection, improved mobile device management, wireless application distribution, SSL VPN, support for multiple exchange accounts, and support for multiple search engines, now Google, Yahoo and Bing are options in iOS 4. 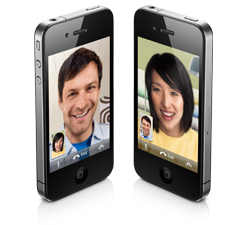 FaceTime is what is going to make the iPhone the must have device. Realtime video conferencing on the iPhone with a few initial caveats. iPhone 4 to iPhone 4 only and only works where there is WiFi in 2010. The good news is no setup required, works in portrait or landscape mode and can use the front or rear camera. Apple has already announced they are submitting FaceTime as an Open standard so that other phone manufactures and other software companies can opt to use it. I can see a world in the next two years where we can make video calls to iChat users, Skype Users, Android Phone users, Cisco Video Phone users and even Microsoft Live users and be able to have a face to face chat. Even the applications for the deaf are going to be astounding. The iOS upgrade will be available June 21st and will be free for all iPhone 3G, iPhone 3Gs, iPod Touch 2nd generation and newer, devices for free. Apple will be offering a new iPhone dock for $29.00 not any different from the 3G dock just shaped to hold the iPhone 4. Apple is also attempting their own case for the iPhone called bumpers and it wraps around the phone and come in five colors. Front and back are open to show off the iPhone 4. Almost as interesting as what was covered in the two hour keynote is what wasn’t covered. No announcement of iPhone being opened to other carriers in the US. I remain convinced that will happen in the near future. That is why I think AT&T increased there early termination fees from $175 to $350. AT&T caping bandwidth, charging premiums and providing substandard voice services are pushing customers to want to move to other networks and keeping some people from buying iPhones in the first place. Also Apple didn’t announce a new MacBook Air, Mac Pro, or iMac all of which were do for a refresh. There were also mentions of a new Apple TV which didn’t materialize and no mention of what the data center in North Carolina is being built for. Apple promised some big announcements this year right after announcing the iPad. Also conspicuously missing at the Developers Conference was any mentions of OS X 10.7. If Apple holds to their release schedule we should have an updated OS available between February 2011 and August 2011. So probably Apple will hold that announcement back for the next developers conference and give developers time to update applications prior to the release of 10.7. It would still be nice to see what they have planned. I expected there to be more announcements at the developers conference than we got. Apple has the Moscone Center booked again later in the month, perhaps Apple has more announcements planned this year keeping them front and center in the news. January we had MacWorld, in February Apple announced the iPad, April and May the iPad is released with a lot of media coverage. Now June we have the iPhone 4 being released which will surely be heavily covered by the media. I am sure Apple will have more announcement this year that will keep them front and center in the public eye through 2010 easily.